The experts at the Canadian Centre for Policy Alternatives’ Ontario office have been tracking economic developments in Ontario throughout the year. Some problems persist: the gender pay gap, social assistance poverty, the use of expensive payday loans as a last resort because traditional banks fail to serve low-income customers as well as they should. Some things are shifting. For instance, in some pockets of Ontario, the employment rate has been on the rise. Oshawa, Windsor and Sudbury are the beneficiaries in that department. 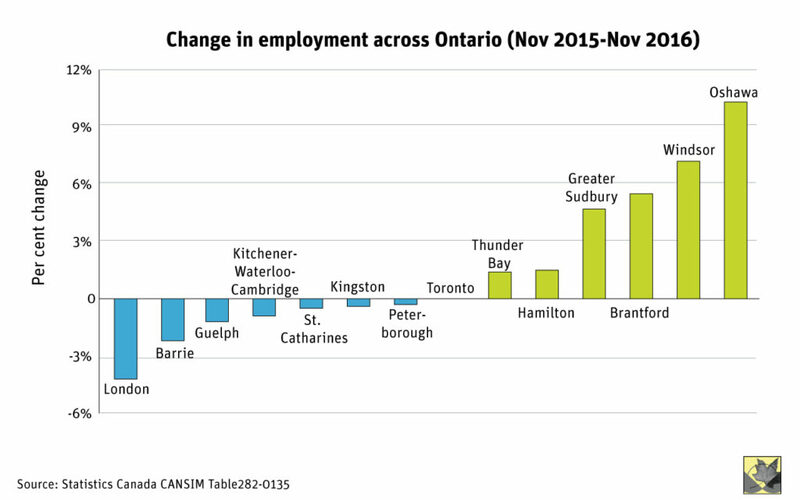 More attention needs to be paid, however, to job growth in London, Barrie, Guelph, St. Catharines, Kingston, Peterborough and Toronto. Here are 10 charts that helped define the state of income, work, and the role of government in 2016. This chart reveals a disturbing and persistent pattern: it shows how different the distribution of men’s and women’s earnings are — and how that disparity persists even as women move up the earnings ladder. 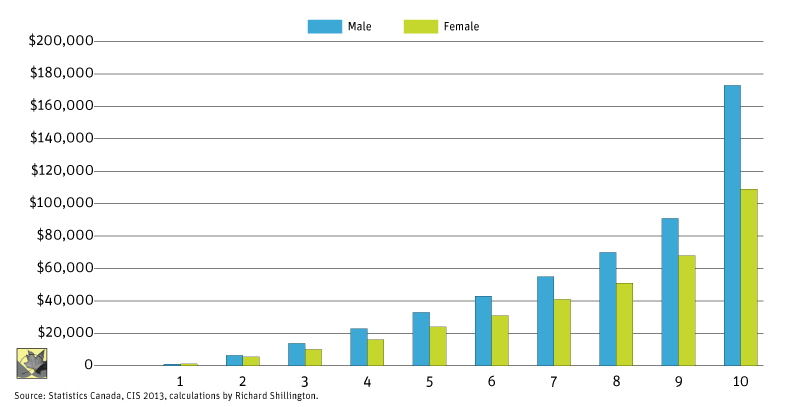 There is a gender pay gap at each step of the earnings ladder in Ontario’s labour market except for the absolute bottom. Ontario’s persistent pay gap is the motivation for the Equal Pay Coalition’s annual Equal Pay Day (set your calendar to April). We know that people who qualify for social assistance live in poverty, but by how much? 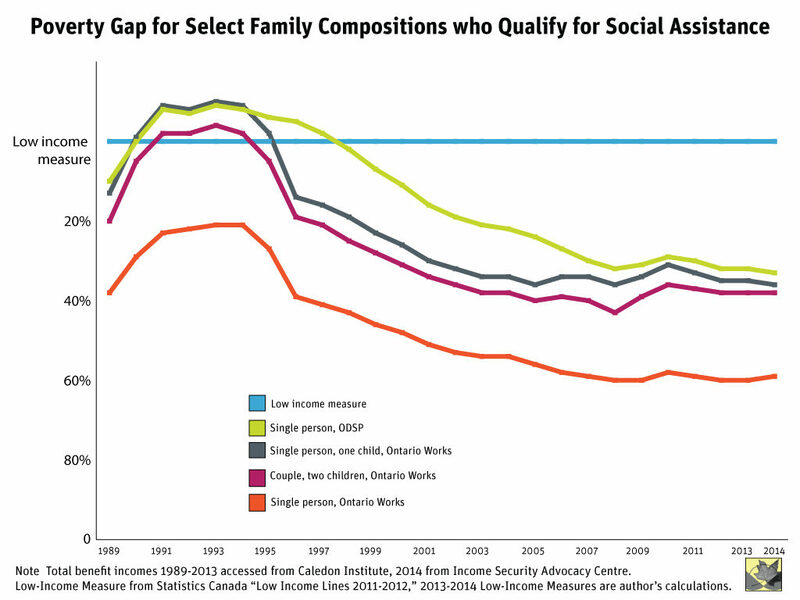 This chart tells the stark story: it illustrates the deep erosion of total social assistance benefit incomes compared to the poverty line for all Ontario family types since 1989. In her report, however, CCPA Research Associate Kaylie Tiessen found that the poverty gap was biggest for single adults who qualify for Ontario Works or its equivalent: the poverty gap grew by almost 200 per cent since 1993. It’s time to raise the rates. 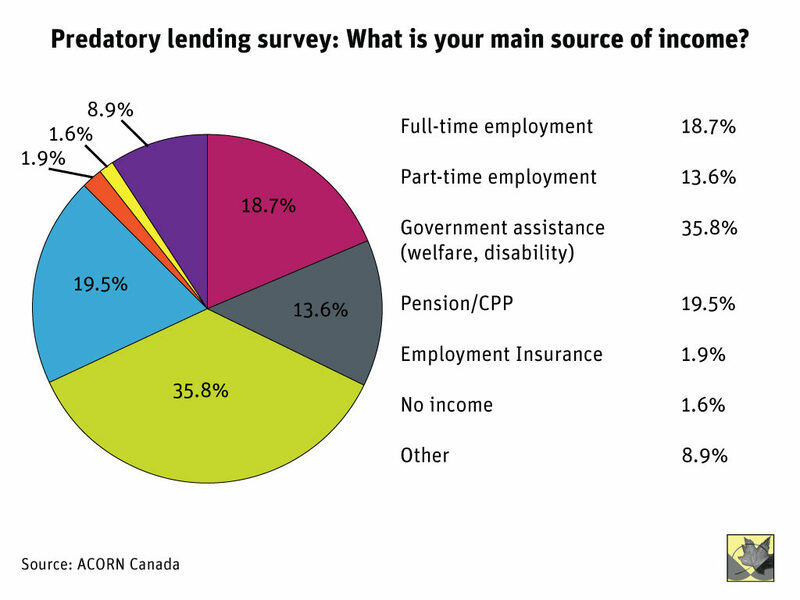 In his report on ACORN Canada’s survey of its members, Ryerson University Public Policy Masters student and CCPA-Ontario intern Joe Fantauzzi reported that 18.7% of respondents who used predatory loan services had full-time work, while 35.8% received government assistance. They turn to predatory loan operations because their traditional banks deny them basic services like cheque cashing and overdraft protection. And they use those high-interest loans to pay for basic things like food and rent. That’s why ACORN Canada is waging a campaign to change federal financial laws to protect low- and moderate-income workers from predatory loan providers. Ontario is moving toward modest reforms on this front, but Tom Cooper explains on the blog why it’s not enough. Yes, the minimum wage has gone up in Ontario since the mid-2000s, but it still has not returned to the purchasing power of 1976. And it still locks a full-time, full-year minimum wage earner into working poverty. 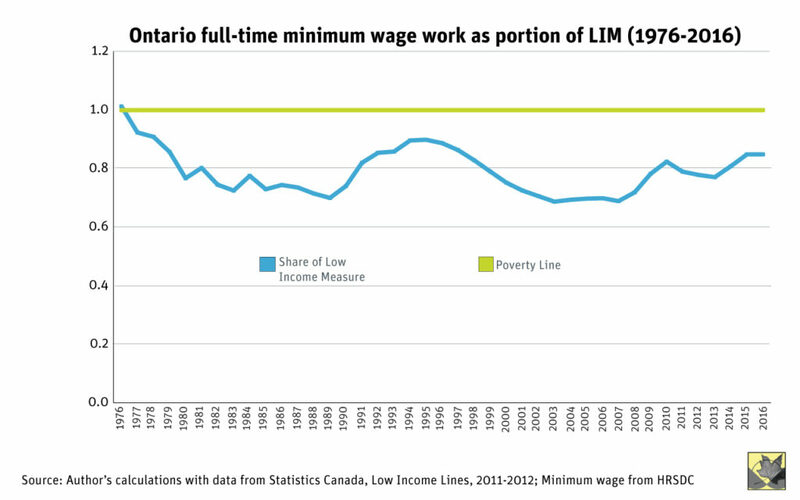 In 2016, Ontario’s minimum wage remained below the poverty line, even as Ontario raised the minimum wage to $11.25 per hour in October. That is what’s fuelling Ontario’s $15 and Fairness minimum wage campaign. Full-time jobs grew in Ontario in 2016, but where did the employment rate rise and where did it fall? London was hit hardest, with a -4.2% change in employment. Oshawa and Windsor saw a gain of 10.3% and 7.2% over the course of the past year. Meanwhile, Toronto saw no change at all from November 2015 to November 2016, despite being the province’s largest city. And take a close look at what’s happening in Barrie, Guelph, Waterloo region, St. Catharines, Kingston and Peterborough. Ontario needs a serious job creation plan. Everyone knows how expensive it is to buy a home in Ontario, but what about rent? When compared to homeowners, it is evident that renters are far worse off when it comes to adequate incomes and needs for shelter. 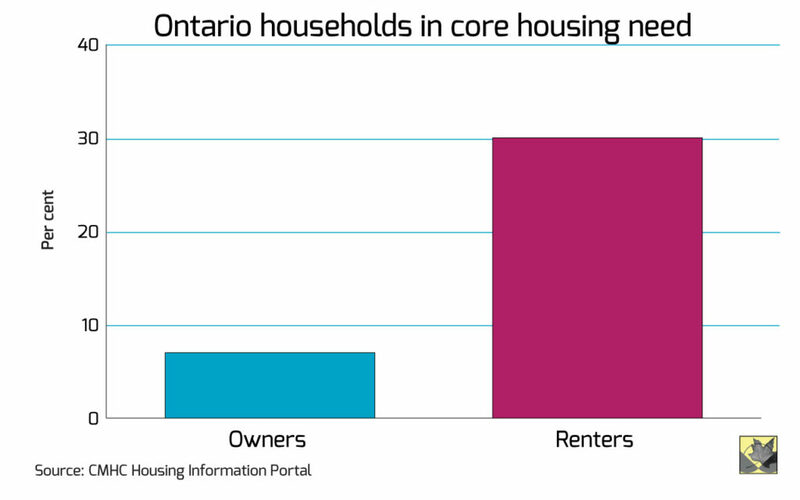 CMHC data shows homeowners in Ontario have approximately double the household income (before taxes) of renters. At the same time, almost 30 per cent of renters are in need of core housing, compared to 7 per cent of homeowners. Ontario is promising modest relief for home buyers, but Zohra Jamasi explains on the blog why it’s not nearly enough to address affordability issues. #7: Home Sharing or Alt-Hotels? Airbnb promotes its listings as homeowners sharing their home to get a little extra income. But our first snapshot of Airbnb activity in Toronto shows that 64 per cent of all listings are for an entire house, condo, or apartment. 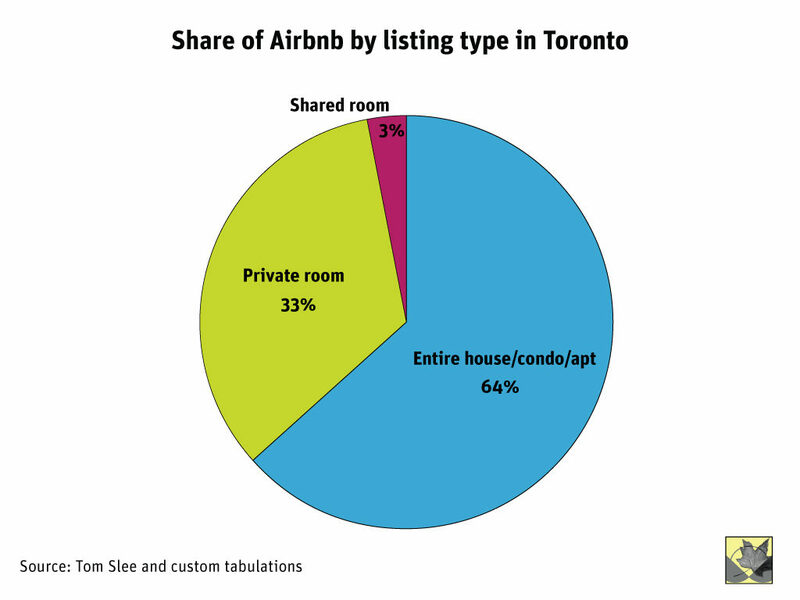 And 13 per cent of Airbnb hosts list more than one property while accumulating almost half of the estimated revenue from short-term rentals on this platform in Toronto — they’re acting more akin to a commercial host than someone sharing a room in their home. Why does it matter? Because short-term rentals can eat into long-term rental options. Also, those commercial hosts aren’t operating with the same laws as others. That’s why the coalition Fairbnb is saying it’s time to level the playing field. It’s the largest city in Ontario and its problems are growing faster than its revenue sources. 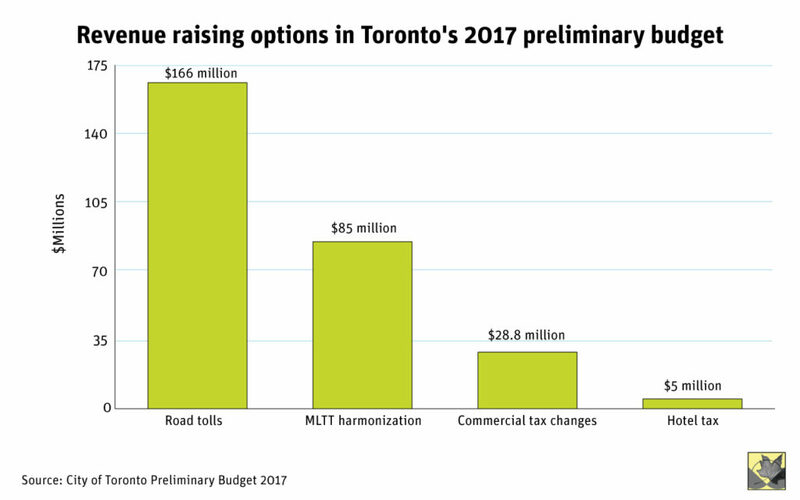 That’s why Senior Economist Sheila Block, who has been publishing revenue-raising options for years, is heartened to see city leaders begin the discussion about raising new sources of revenue to pay for things like public transit (though city council shouldn’t forget about funding its poverty reduction commitments too). This chart shows how much revenue the current options on the table could yield if city council votes to support the current revenue proposals that the mayor is backing. The proposal is contentious, but at least the city is moving to address its revenue shortfall. And it’s a relief to see the proposal to partially sell off a vital public utility, Toronto Hydro, has been taken off the table. For years we have been told that the provincial government wants to be an activist government but that it doesn’t have the money to do it. 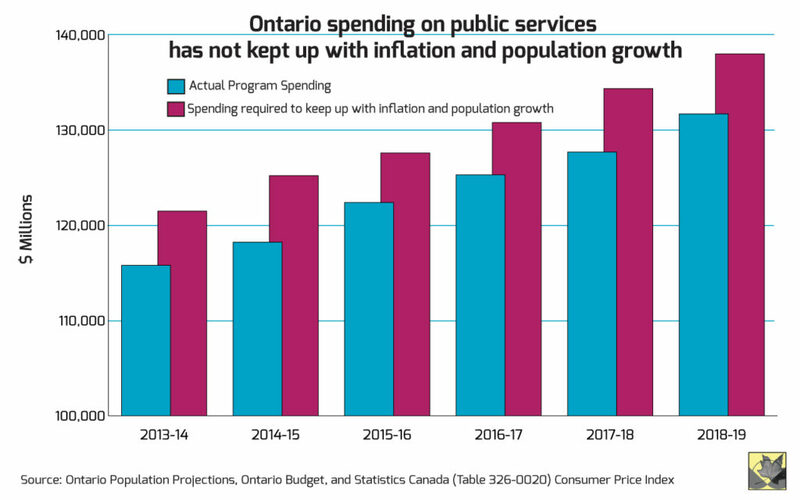 As a result of fiscal austerity, the province’s investments in public services has not even kept up with inflation and population growth. Time to close that gap. Our 10th and final chart shows why 2017’s provincial budget will have room for new investments in public services, at long last. When the Great Recession of 2008-09 spilled into Ontario, the province helped keep the Ontario economy from going completely into the ditch by deploying stimulus budgets. It meant going into fiscal deficit, but that investment staved off a worse recession outcome. But it’s been a long climb out of that deficit hole. Ontario has implemented austerity measures since 2012. It has affected public services. We’ve held off on investments in supports to the vulnerable. Many public sector workers haven’t had a raise in years. 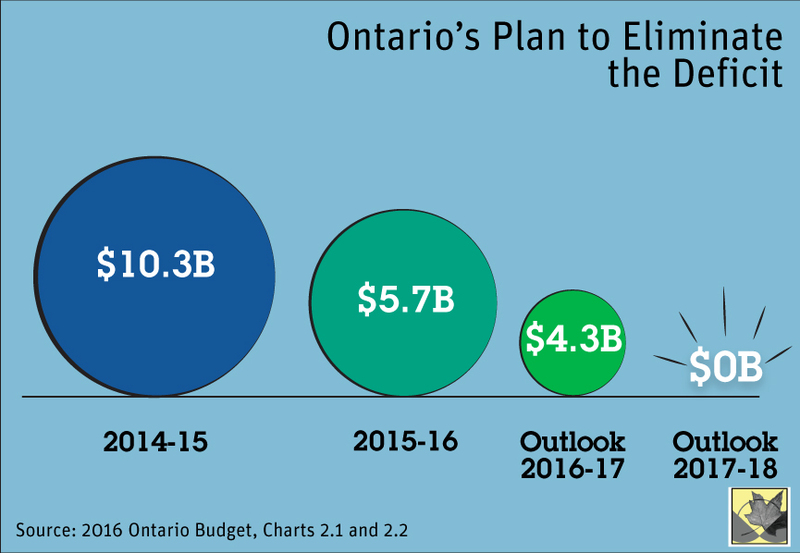 But in 2017, we could finally see the light at the end of the tunnel: Ontario’s budget will be balanced. Time to move beyond austerity and reinvest in the things that make all of our lives better. Trish Hennessy is director of the CCPA-Ontario. Manisha Aggarwal-Schifellite is a communications associate with CCPA-Ontario. I don’t see anything about promoting a policy of reducing the obscene level of inequality in Ontario. We need to change the tax system to make it more progressive. Increasing min wage is good but not nearly enough. On the Airbnb aspect, just because a place is listed as “entire apartment” does not mean it would be rented to long term tenants if it were not being used for Airbnb rentals. We list our basement as “entire apartment” because we close it off from the rest of the house when we have Airbnb guests. They have a private entrance and never enter the rest of our home. But our basement doesn’t have a kitchen, so it is not possible to rent it as an apartment. My point is that relying on Airbnb listings to determine the number of units being taken off the rental market is unreliable. Many people list their places as “entire apartment” even though it could never be rented long-term.